Each week, we note and comment on the NFL’s biggest transactions. Here are the transactions between the end of Week 6 and the beginning of Week 7. Note that we covered the Brandon Lloyd trade in this post and Carson Palmer in this one. Saints (put C Olin Kreutz on reserve/left squad list) – Kreutz apparently lost his shine and his desire to play in New Orleans – and was about to lose his starting job as well after poor play this season. So Kreutz left the team, ostensibly to retire. He’s now out for the year. Steelers (put DE Aaron Smith on injured reserve, promote DE Corbin Bryant) – Smith, long one of the league’s best 3-4 defensive ends, battled injuries again this season and now will miss the rest of the season. Lions (put RB Jerome Harrison on reserve/non-football injury list) – Harrison, who was traded to the Eagles, flunked his physical in Philly because of a brain tumor he didn’t know he had. He had successful surgery, but he’ll miss the rest of the year. 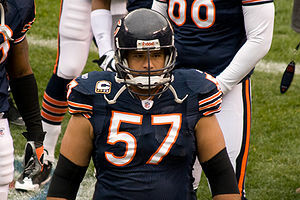 The Lions signed Eldra Buckley to replace Harrison. Raiders (add S Chinedum Ndukwe and PK Dave Rayner, put DE Matt Shaughnessy on injured reserve) – Shaughnessy, one of the league’s unsung but talented defensive ends, will miss the rest of the season. Ndukwe gets a shot to add depth at safety; Rayner becomes a Week 7 fill-in for Sebastian Janikowski. Jaguars (sign WR Mike Sims-Walker) – Sims-Walker was a bust in St. Louis, and he was released when the Rams acquired Brandon Lloyd. But when he hit the open market, the Jaguars swooped in and brought him back to Jacksonville, where he was a starter for years. Panthers (put OT Jeff Otah on injured reserve, bring back OT Reggie Wells) – We discussed Otah’s injury and its aftereffects in this post. Redskins (put OG Kory Lichtensteiger on injured reserve) – Lichtensteiger, the starter at left guard, will miss the rest of the season. Seahawks (put CB Marcus Trufant on injured reserve) – Trufant, the long-time corner in Seattle, is out for the year due to injury.